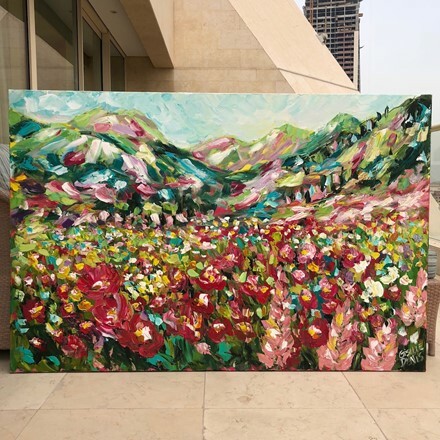 While I was painting this piece at the Raffles Hotel spring my residency in Dubai, a woman approached me to ask some questions. She kept smiling as if she was seeing inside my soul. Then she said, “I see things in people. I recognize things about them. What I see in you is a shining soul.” Wow! Her words stuck with me as I received her compliment. One thing I have been doing for many years now is accepting and receiving compliments with grace and love. We tend to shy away and not take compliments well. But compliments are a gift we can give one another and I think that is a beautiful thing. It is beautiful to offer a compliment and a beautiful thing to receive them as well.